Many homes are equipped with a forced-air furnace, other homes, such as older, vintage and historic homes, may be using a radiator and boiler combination to heat. That’s not to say newer homes aren’t also taking advantage of energy efficient radiator systems, because they are. Regardless of whether or not you’re dealing with an older radiator or a new model, repairing a leaking radiator and/or installing a new boiler is a big project that requires the expertise of a professional contractor. Radiator installation requires the services of a licensed contractor. His or her expertise covers everything from disconnecting wiring and pipes, removing the old radiator, installing the new unit, to reconnecting the wires, pipes, and gas or oil lines, if applicable. If replacement of existing wiring, pipes, or valves is needed, the contractor should have the credentials to address the installation process from beginning to end including any unforeseen problems. 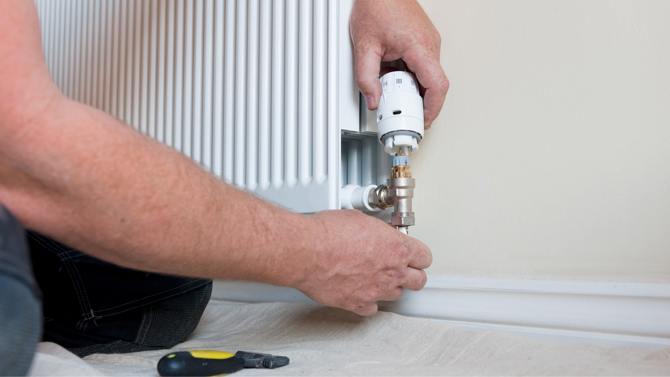 It is recommended that if a new radiator is being installed that the existing boiler be inspected to ensure it is up to the task of handling a newer and possibly more efficient radiator system. It is recommended that you request at least three estimates for a repair or installation of a radiator system. Ensure each has the proper license, insurance, and certification necessary to handle all areas. Verify the contractor’s license is current and if there are any complaints or pending legal issues with the Better Business Bureau. Be sure before you sign any estimate or contract that the entire form is filled out – no blank spaces – with the cost of labor, parts, materials, and removal of old equipment, dated, and signed by an authorized person, and that you understand the warranty and after-service agreement. If your home is fitted with old or antiquated radiators that are unsightly and detract from the décor of your home’s interior, they can be replaced with a stylish wall or conventional model. This way you’ll retain the efficiency of a radiator with a more modern style of radiator installation. Most radiators have the option of being in the “on” or “off” position. An added benefit is the use of a TRV valve that is designed to allow the homeowner to set and regulate a specific temperature. If your goal is to maintain the authentic look of your home while enjoying energy efficiency, it is also recommended that you install a modern and efficient boiler along with new lines and piping to pair up with the original radiator. Prior to buying a new boiler, you should have the current boiler unit inspected to find out if it will accommodate the pressures of a new radiator system. An upgrade may be necessary so you don’t run into slow or low water pressure that won’t be able to adequately “fire up” the heating process of the radiator installation. On the downside, if you’re contemplating removing a non-functioning radiator versus repairing it and installing a forced-air furnace, keep in mind your home will have to be updated to switch over from one type of heating to another. The upgrades include, but are not limited to, installing dropped ceilings throughout the home for the required ductwork necessary in each room or area to be heated. This can add significantly to what could have been a minimal radiator installation project. The process is relatively simple; steam or circulating hot water are what prompt a radiator to generate heat. As the water is heated, the radiator(s) gives off heat which in turn warms the air in each room(s) either by convection or radiation. Radiation – once the hot water has made its way to the radiator, it will “radiate” heat into the area. Radiation is a small percentage of the overall heat produced by a radiator. Convection – with this process, heated air from the radiator rises. As it does so, cool air is drawn into the underpart of the radiator. This rising and drawing in motion of the air creates vertical currents that evenly disperse heat into the room. If the radiator is at fault, it can be due to a couple of problems. This doesn’t mean the system has sprung a leak and is bleeding water into your home. It is a natural process that occurs if your radiator system isn’t working as it should. If you find your radiators aren’t warming up a room like they should, the chances are there is trapped air inside the radiator that needs to be “bled” from the system. It’s an easy enough repair for a professional contractor on this type of radiator installation project. This is the real deal type of leak that can range from minor to severe. Where the leak is happening also plays a role in how easy or difficult the repair will be. Between steam radiators and hot water radiators, the steam model is easier to repair. In order to make repairs, the leak must first be located. Next in the radiator installation process, the radiator must be drained and the leak area cleaned, and then repaired, if possible, by a contractor. There is no magic product you can pour into the radiator that will patch, and hold, a leak. Your contractor will advise you of the best approach to repairing or replacing the radiator. 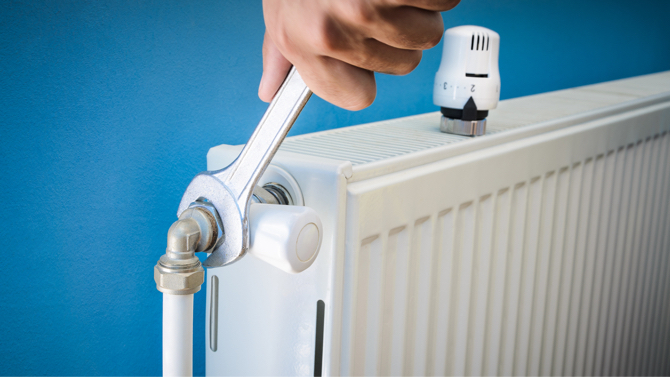 Keep your radiator and boiler system in good working order with periodic visual checks for leaks or malfunctions of the unit such as crimped or clogged lines. For a more in-depth maintenance check, hire a professional and certified contractor to run an annual check on the entire system. This will include inspecting for leaks, corrosion on lines, faulty valves, thermostat check, gas or oil lines, lubricating specific parts, if needed, and checking the electrical wiring. Homeowners have many options when it comes to heating and if your choice is to keep your radiator maintained, repaired, and in good working order, you can expect energy efficiency and cost effectiveness to offset potential repair and installation costs. The cost of radiator repair and installation is paid back many times over with a properly running radiator that will provide ample warmth for years to come as long as it is serviced and maintained annually.